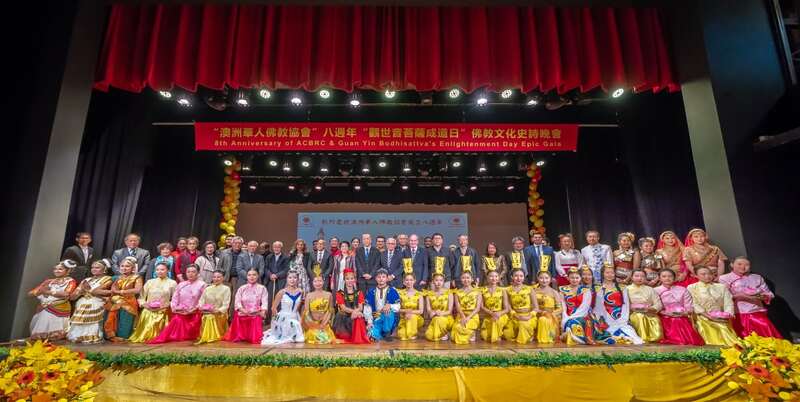 The Australian Chinese Buddhist Research Centre (ACBRC), the Australian Oriental Media Group and the Australia Oriental Media Buddhist Charity Association organized a large-scale cultural gala at the Hurstville Entertainment Centre on 31 July 2018 to celebrate the 8th Anniversary of the ACBRC and Guan Yin Bodhisattva’s Enlightenment Day. Nearly 1,000 people attend this magnificent event, including Buddhist clergy, friends, and spectators from all over the world, as well as over 70 dignitaries such as local politicians, Chinese community leaders and artists in Sydney. ACBRC’s president, Buddhist Master Jun Hong Lu, also attended this epic cultural performance. Dr Hari Harinath, Chairman of Multicultural NSW, and Ms Le Lam, Emeritus Mayor of Auburn City, gave special thanks to the ACBRC for its years of contribution to promoting Buddhist culture and a cohesive multicultural society in their speeches. They praised the great influence of Buddhism’s wisdom on humanity. 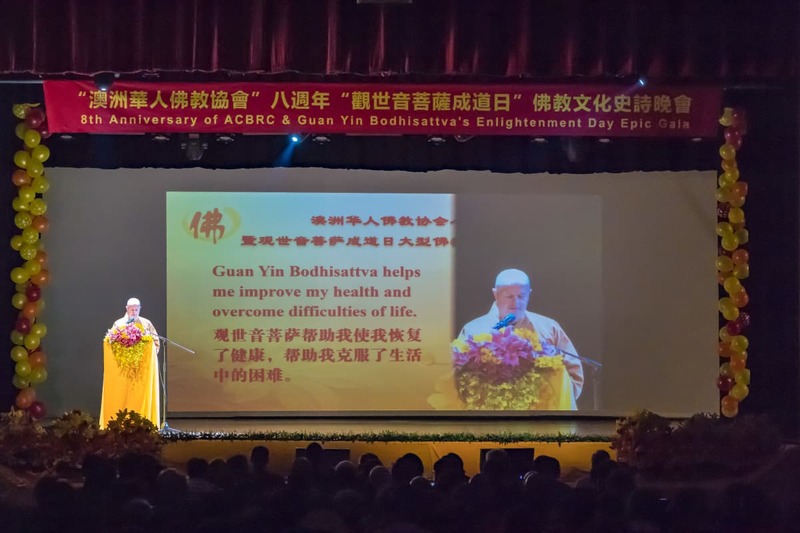 ACBRC’s Vice-President, Venerable Shi Xin Wu, expressed his gratitude to Guan Yin Bodhisattva. He said ACBRC will be committed to carrying forward Chinese culture and the essence of Buddhism, and promoting charitable activities. The evening event was composed of four parts. It began with a video introducing the origin of Buddhism, and its transmission and spread in China. 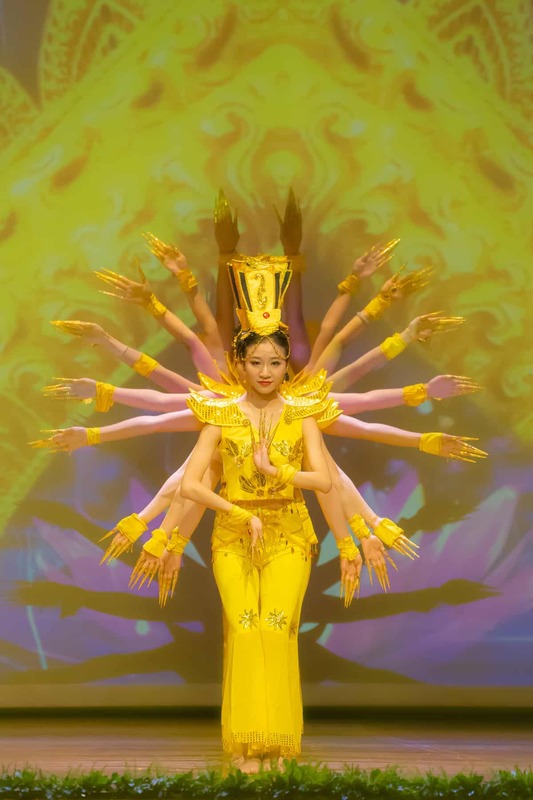 The dancers from the Australian Oriental Media Group performed several dance pieces, including “The Thousand-armed Guan Yin Bodhisattva”, “Apsara”, Tibetan Dance, Xinjiang Dance, Peacock Dance, and “Girls from India”. 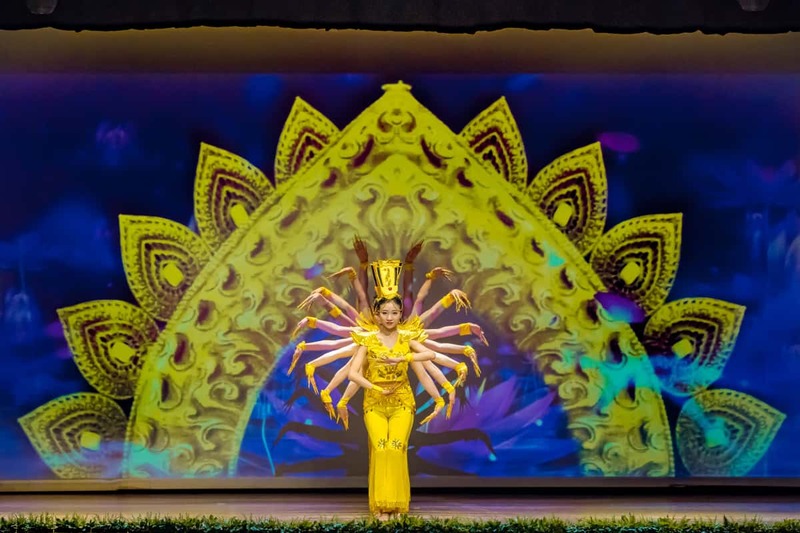 Artists from India and Thailand added variety to the already mesmerising programs with their splendid dance performances, tinged with Buddhist culture. Famous Australian singers Jing Feng, Yu Bao, and many award-winning young singers including Anthea Chai, David Li, Haiyang Wu and Sophia Qi altogether took the audience on an emotional journey with their rendition of several popular songs, including “The Wonderful Words of Lotuses”, “Wu Kong”, “The Heart Sutra”, etc. Radio personalities from Australia Oriental Radio, such as Liu Jianping, Li Pu, Zhao Lijiang and Jing Hua, gave the audience a sense of profundity and serenity with their interpretation of stories about Guan Yin Bodhisattva, and the recitation of the Words of Wisdom from Master Jun Hong Lu. The Buddhist cultural gala brings together Buddhist philosophy and arts, showcasing the great charm of Buddhism. 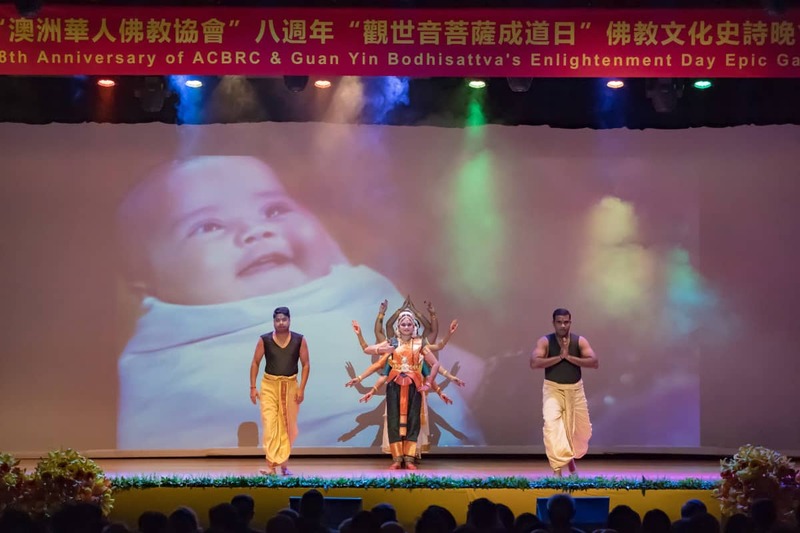 ACBRC will continue its endeavours to spread Chinese culture and the essence of Buddhism, and contributing to a cohesive multicultural society and a peaceful world. Under the leadership of Master Jun Hong Lu, the Australian Chinese Buddhist Research Centre (ACBRC) has been devoted to promoting traditional Chinese culture and Buddhism ever since its establishment. It organised hundreds of public talks on Buddhism around the world to promote Chinese culture, spread the essence of Buddhism, foster cultural exchanges and world peace. With the Buddhist core values of loving-kindness and compassion, ACBRC encourages people to do good deeds, care for the elderly and young children, support the spread of Buddhism and charities, and play their roles in maintaining harmony and peace around the world.